Aims/hypothesis: Diabetic retinopathy is a serious complication of diabetes mellitus and can lead to blindness. A genetic component, in addition to traditional risk factors, has been well described although strong genetic factors have not yet been identified. Here, we aimed to identify novel genetic risk factors for sight-threatening diabetic retinopathy using a genome-wide association study. 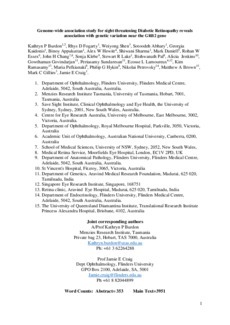 Methods: Retinopathy was assessed in white Australians with type 2 diabetes mellitus. Genome-wide association analysis was conducted for comparison of cases of sight-threatening diabetic retinopathy (n = 336) with diabetic controls with no retinopathy (n = 508). Top ranking single nucleotide polymorphisms were typed in a type 2 diabetes replication cohort, a type 1 diabetes cohort and an Indian type 2 cohort. A mouse model of proliferative retinopathy was used to assess differential expression of the nearby candidate gene GRB2 by immunohistochemistry and quantitative western blot. Results: The top ranked variant was rs3805931 with p = 2.66 × 10−7, but no association was found in the replication cohort. Only rs9896052 (p = 6.55 × 10−5) was associated with sight-threatening diabetic retinopathy in both the type 2 (p = 0.035) and the type 1 (p = 0.041) replication cohorts, as well as in the Indian cohort (p = 0.016). The study-wide meta-analysis reached genome-wide significance (p = 4.15 × 10−8). The GRB2 gene is located downstream of this variant and a mouse model of retinopathy showed increased GRB2 expression in the retina. Conclusions/interpretation: Genetic variation near GRB2 on chromosome 17q25.1 is associated with sight-threatening diabetic retinopathy. Several genes in this region are promising candidates and in particular GRB2 is upregulated during retinal stress and neovascularisation.